Do you find it really hard to follow the going to bar and clubs route to meeting women? This obviously has been heavily pushed by pick up artist advice, in particular the last decade. Do you hate bars and clubs for that matter? Have you ever been asked when you're out, "Why are you so quiet?" or do you sometimes feel energy drained at long social events, or after those events, or when you're socializing in large groups of people? Do you prefer hanging out with people one-on-one or in small groups, instead of larger groups? These are all possible indicators that you're an introvert by nature. Taking account of this and modifying your approach, or strategy, to work with it rather than just kind of pushing up against it is going to be the path of lesser resistance. That means the easier root to you getting results in this area, and that means meeting women, dating women, relationships, and all of this good stuff. Now there's probably 50% of you listening to this that are in this situation. I actually think it's a lot higher percentage based on the types of people I've related to, the types of people I know that listen to this podcast, and so on, and that we coach. The profile tends to be a higher percentile of introverts or just people who have a stronger intra-tendencies. So this is a really important episode for everyone to listen to. Even if you're an extrovert, it's going to be something worthwhile. Now, I myself used to be very much an introvert. The reason I know this is just because of looking at the changes over time. Also, one of the things we discuss in today's episode is using the Myers Briggs type indicator test. So that's a short questionnaire and it's to clarify if you are indeed an introvert and to what degree. The test gives you a percentage result telling you what percent you are an extrovert and what percent an introvert. So in episode 91 a while back we mentioned a personality test that I've done several times in my career at business school, and by executive consultants who consulted as CEOs to help them optimize their careers and how their dealing with life, and so on, and all the stresses. So I've had that done a few times by professionals. It's called the 16PF (the 16 personality factors), and it's got a lot of empirical evidence to it, but it isn't widely available. That's a really professional test and it gave me a lot of insights into my personality. Now the Myers Briggs on the other hand is very accessible, where you probably won't get access to the 16PF. Like I said, I had professionals give me this test and you can't find it online or get it done. It's a little bit more complex and detailed, and so on. The Myers Briggs is very popular and it's very accessible. There's test online. There's links in the show notes, and it's mentioned in this episode where you can go to get it done in about 10 to 15 minutes online; to find out if you are an introvert and all of this material relates to you more. While there is a bit of controversy about the Myers Briggs and how much evidence there is that it's empirical, that means if there's research behind its validity and so on. The good new is, that I found a study comparing the 16PF, which has a lot of empirical evidence and research behind it to prove it, and it compares it to the Myers Briggs. They found that the 16PF and the Myers Briggs results are highly correlated, which means that they're the same - 40 extroversion / introversion scale. So this is the specific area that we're interested in today, not necessarily other parts of the Myers Briggs test. So I'm not sure how much we should trust the other parts of the Myers Briggs test. But for the extroversion and introversion scale, it is actually very valid and useful. Since we're really interested in this, I'd recommend you do the Myers Briggs at some time before or after listening to this audio; because as we discuss it you'll be able to relate to this whole audio a lot better knowing how introverted you are. After the interview, I did the Myers Briggs test myself and it came back with a 94% extroverted, which is a little bit of a surprise to me and how extreme that is. It's definitely crept up over the years starting from me as an introvert, before I got into all of this over 15 years ago, and all of the training, the experiences, and the learning, and everything that has gone on, and the change. To moderately extrovert a few years ago when I did it again, and now it's looking like I'm more of an extreme extrovert. So that's pretty interesting stuff. I guess I'm living proof that we can reprogram our minds, our inner game and so on, so take that with you if you want to change these parts of you. Today's episode is about leveraging your introversion. It's not about changing it necessarily. Some people may want to change it, but other people may be happy with it. So today's discussion is more about how we can leverage it, how we can work with it, rather than against it. 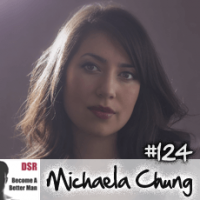 Today's guest is Michaela Chung, who is an introvert coach. She's the founder of the popular blog Introvertspring.com where she has written over 200 articles on topics relating to introversion. When I was looking for quality guest to speak on this topic Michaela stood out among the many I looked at. This was a great and interesting chat I have to say. I think everyone, even the potential extroverts listening to it, will get a lot out of it by being able to understand better the introverts you come into contact with or perhaps are in relationships with, which is approximately 33-to-50% of the population. So you're encountering these people every day. Give some love to Michaela on Twitter to thank her for the advice in this interview. Introvertspring.com: Michaela's website to help others understand and love their introversion, as well as unlocking your natural introvert charisma. The Irresistible Introvert: Harness the Power of Quiet Charisma in a Loud World: Michaela's book showing introverts how to develop your magnetism, reveal your true charismatic self, and empower yourself in unique ways. Introvert Spring Youtube Channel: Youtube videos covering a range of topics for introverts, including how to make friends, loving yourself as an introvert, and how to approach women. Myers Briggs type indicator test: Noted in the introduction and throughout the interview for determining your personality type. 16 Personalities: This website was noted as a favorite of Michaela's for taking the test to determine your personality type. Introverted Alpha: Michaela recommends Sarah Jones and her website as the go to coach for introverted men for dating. The Friend Formula: Michaela recommends Dan Chang, founder of The Friend Formula website, for his advice on how to break through awkward small talk and have interesting conversations. [Angel Donovan]: Hey Michaela, welcome to the show. [Michaela Chung]: Thanks for having me. [Angel Donovan]: It's my pleasure. I always like to first of all dive into a little bit about what triggered your interest in this topic because, you've been talking about introversion and dating and just general socializing for quite a while now? How long has it been? [Michaela Chung]: It's been about three and a half years. [Angel Donovan]: Okay, and where did that all start? Where did it come about? [Michaela Chung]: Yeah well actually, I think like a lot of dating coaches or people have these kind of obsession, it began with a painful experience. It began with me feeling posturized because of my introversion and actually having an experience where, I pretty much was... my energy tanks were low as happens with introverts. I ended up kind of having a meltdown in front of group of strangers. I've told this story a lot. So, I'm not going to get into too much but, I was traveling. I was pushing myself too hard and then, I felt a lot of pressure from the extroverts around me to "Come out of your shell. You know, why are you getting quiet? You have to be social," and I was just really done. I was just... I couldn't really be out there when I was so drained and I realized that if I was having such a painful experience and I was feeling so almost like punished and criticized for just having my own personal needs, then there must be other people out there who feel the same. It was about three months later that I started http://www.IntrovertSpring.com, my website. [Angel Donovan]: Okay, cool and that started as a blog and now you also have a YouTube channel which is where I first came across you. So, what kind of relationship and social life style do you lead today? Like, I guess you've made changes or you've either accepted or you know, things have changed over time. So, what does it kind of look like today? [Michaela Chung]: Yeah, that's a great question and it's funny for me to even look back because, my life is totally different now. Before, I did a lot of things just to fit in and just to feel like a good person, to feel normal. For me, that was a lot of extroverted things. I was a salsa dancer. So, I spent a lot of time salsa dancing, socializing in very, very like high energized or high energy stimulating environments. I would just try and always keep busy because, I thought that's what made me a valuable normal person. Nowadays, I take a lot more time to myself. I work by myself from home. So, that's a big difference and live overlooking the ocean. I'm looking at the ocean right now in this really peaceful community and my life just has a lot more solitude and I don't feel bad about it. [Angel Donovan]: So, did you move... just out of curiosity, did you move there on purpose. Kind of, you know, you felt like next to the ocean would be a good place for more contemplation and so on? [Michaela Chung]: I am one of those kind of love attraction people. So whenever I want to move into a place, I write down exactly what I want and I've always gotten what I wanted. So, I had my list and this had everything on the list even being close ocean, I had said and this is right on the ocean. When I came to see it, it was just like, "Wow, this is the perfect to write a book and to recharge as an introvert." [Angel Donovan]: Yeah, yeah, excellent, excellent. Okay well, let's dive into what is extroversion and introversion. As I've read a bit more about it, I understand it's not really clear. People kind of have an idea of what it is or what they think it may be or it is but, that's not necessarily exactly kind of the definition. So, how do you define it? [Michaela Chung]: Definitely, yeah there are a lot of misconceptions. An introvert, the basic definition is an introvert is simply someone who is energized by being alone and who is drained by stimulating environments. So, social situations are very stimulating. They're very draining and also, crowds, things like amusement parks, lots of noises and bright lights and extroverts on the other hand are the opposite. They're energized by stimulating activities and by social activities. [Angel Donovan]: Okay so it's kind of like, how you feel after you've been socializing for two hours? Would that be like a good way to...? [Michaela Chung]: That would be a great way to gage it, yeah. If you've been socializing for two hours, if you're an extrovert you'd be like, "No problem. I'm ready for more." You'd just be warming up probably and for an introvert you might be drained and ready to go home but, keep in mind, it's on spectrum. So for certain introverts, they can handle more time out, more socializing than others. [Angel Donovan]: Okay and do you think extroverts have limits in terms of their social time? So, I used to coach and in clubs and in places like that for a while and I know a lot of other coaches. So, we'd be doing that say ten hours in the whole day and talking in a seminar as well. We'd literally have to take the next day completely off chilling in front of a TV because, we'd be so drained. This is something pretty much consistent, everyone I've ever spoken to. So, I was just wondering if you think like an extrovert also have kind of these social limits but, they're maybe just a lot higher? [Michaela Chung]: Definitely, like I said with the spectrum, nobody's completely 100% extroverted or completely 100% introverted. So, an extrovert will be able to socialize a lot more but, they're going to need a break too. For me for example, I can public speak. I do podcasts. I do webinars and I have the ability to public speak but, it is much more draining for me even doing a podcast interview or especially webinars because I use videos. I will feel drained afterwards whereas an extrovert, it might take a lot more. It might take a whole day of doing coaching over the phone or doing webinars. [Angel Donovan]: Okay so, I want to make sure the guys at home and the girls (I know some girls listen to this podcast too) that they understand what introvert and is what it isn't. What other ways could they use to recognize if they fit into this introversion mold? [Michaela Chung]: So, another big thing is the way that introverts communicate. So, introverts are known for being quiet and for hating small talk. So, we tend to be the people at the party who are either off to the side kind of observing or they're in small groups or just one-on-one and they tend to want to just dive right into a deep or really interesting conversation. They're that interested in group conversations or small talk which is pretty hard to get around but, that's their preference. Introverts also need more time to think before they speak. So, they might pause of a long time or just kind of feel like they've missed the boat and then, they don't say anything at all. That's why they don't like group conversations because often, it escapes them and they can't really catch up. [Angel Donovan]: Okay, okay interesting. Right so, I'm sure a lot of people at home are starting to kind of figure out, "Maybe this is me." So, another aspect I come across quite often is kind of emotional versus logical conversations. I know a number of the guys I've come across over time tend to have a very logical way of talking and sometimes, they find it difficult to be more emotionally expressive. I don't know if you understand exactly what I mean but, it's kind of inject playfulness, inject more emotion, kind of more lightness but, also just like a different variety of emotions into their speech. So, kind of like a story teller would. That would be an extreme version of it. If you think about in a movie, a guy's telling a story, you can kind of feel the emotions in it. You know, in every day conversation there tends to be a fair amount of emotions in it. Is this anything related to introversion or is this something different? [Michaela Chung]: I do feel like that has more to do with whether you're simply a more feeling kind of person or a more logical kind of person. Like maybe your Myers-Briggs type, which I'm sure we'll talk about later and I think it's cultural. Like I think in our culture, we just feel more inhibited in general and maybe extroverts, they need less warm up time. So, they can be more expressive but, introverts are just as capable of being emotionally expressive. [Michaela Chung]: It's just that, yeah they might need more time to do so. [Angel Donovan]: Okay, is it also a comfort level? Like so, when you were saying earlier that introverts are better on one-to-one. So if they got a close friend, is it relatively straightforward and maybe they don't take so long or is it kind of the same all the time? [Michaela Chung]: Definitely, I do feel like introverts have a select few friends or maybe even just one close friend that they are very expressive with that they really open up to and it can be like night and day the difference between them with acquaintance versus them with their true friends. [Angel Donovan]: Okay great. One of the test of course that people use a lot in relation to introversion and when I was kind of looking around YouTube and places like that, I actually noticed there's a lot of introversion and introvert video blogs and stuff like that which I was pretty surprised about. It seems to be quite a popular topic now and a lot of people are talking about their Myers-Briggs results. What do you think about the Myers-Briggs test and also, like I've just been interested in it? Have you noticed that there's a lot more people? It's a very popular topic. There's kind of movement in this? Is it a certain age group? Like I was thinking it's more millennials that have been talking about this topic and getting into it. One interesting like V-log I just feel across was just a girl. She was just talking about how she's an introvert and she's just V-logging about it like every few days and I imagine there's a lot of introverts kind of watching that, right? It was kind of a surprise to me to come across all this stuff because, I hadn't realized it was such a popular topic. [Michaela Chung]: Yeah definitely, I'm finding nowadays more and more all of the people who don't feel like the real world congregate on the internet. So yeah, the more of an outcast you feel like or the more different you feel, the more you're going to seek out your people on line. That's been the case with introverts and it's funny because, there are a lot of introverts out there. Researchers estimate that's it's one third to one half of the population are introverts. So really, there are a lot of us. It's just that we didn't know it. We were kind of all keeping quiet about it. As far as Myers-Briggs, I think once people learned about introversion and extroversion, they just wanted to take it a step deeper. So now, they're really interested in Myers-Briggs and it's funny because, I actually just did a personality-type week on my blog on http://www.IntrovertSpring.com. [Michaela Chung]: We covered all the different personality types and everyone was really grateful and happy to see even more detailed descriptions of themselves and they're like, "Yes, this is me to a T." There's something really validating about that. To know that, "Oh, there's nothing wrong with me. This is just how I am. This is just my personality type." [Angel Donovan]: Yeah, and when you do that personality-type test, this is basically a questionnaire? [Michaela Chung]: Yes, yes, exactly. [Angel Donovan]: And then, it gives you these four letter which basically give you your type. So for instance, if you're an introvert, you could be something like INTG as I understand it and others. It gives you this explanation of the types of behaviors? What kind of things does it give you in terms of feedback? [Michaela Chung]: It can scary in-depth. Like for me, I'm INFP. So, that's introverted, intuition, feeling and perceiving and so, the basics of an INFP... So introverted, we already covered what that's all about but, more intuitive. So less about the more concrete stuff that's out there and sensing and getting out there and feeling things. They're more about going inwards and thinking about patterns and connections. It also goes into things like the way you might express yourself. So, INFPs are very expressive for example. They're known to be artists, writers which I am. So, they really are very true to your personality and they can be quite in depth. [Angel Donovan]: Right, is there any official site or like, if someone wanted to go and do one of these test, where would you recommend that they go for the... I don't know, the most objective assessment for this? [Michaela Chung]: I like the one on, I believe it's 16 personalities but, if you just... really, if you just Google "Best Myers-Briggs Test Online" then, the top two come up and I find those ones quite good. [Angel Donovan]: Okay, pretty consistent. How long does it take to do these tests? [Michaela Chung]: ... or an hour or so, yeah. [Angel Donovan]: I was thinking like a ten-minute questionnaire. [Angel Donovan]: So, it's a bit different? [Michaela Chung]: ... because, it is quite detailed. [Angel Donovan]: Okay, alright so, if they were going to go out and do this, is it a... one of these selections? You select multiple choice or is it...? [Angel Donovan]: They're going to fill in 100 or so questions over time. Okay, alright, alright good. So, do you find this is a pretty accurate for introverts to self-identify and do a lot of the people you coach and talk to use this test? [Michaela Chung]: I think yeah. A lot of people in my community do just because, you know that's kind of... it's related to introversion. For me, I don't use it. I haven't used it much in my coaching or in my courses. I just focused mainly on the introverted aspect but, I am very interested in getting more into... it's kind o taking it step deeper and getting more into the Myers-Briggs because, you're able to understand people that much more. It's not just about understanding yourself. You can understand the other personality types as well and how they work and how you can communicate better with them. [Angel Donovan]: Alright so, I was just telling you just before we started that a bunch of us dating coaches who have been around for 15 years or so (so, the oldest guys from a group of male coaches) we did the Myers-Briggs 20 years ago in school and stuff. Most of us were Is back then. So, the introvert one and then, about three years ago or so, we had a discussion and everyone had a... pretty much everyone actually had moved to an E. So, an extrovert. You had some interesting thoughts on that. [Michaela Chung]: Yeah, that brings up an interesting question and it's, is introversion innate and do you have it for the rest of your... are you introverted for the rest of your life or is it something that changes. I believe it's a bit of both but, I do believe it's more inherent and you are introvert from infancy and you stay that way. However, I do think that your behavior can change. So, you can choose to push yourself more and to go out more but, there are always going to be some consequences to that for people who are really inherently introverted. For perhaps for me for example, when I was really putting myself out there a lot and to keep myself busy all the time and trying to be an extrovert, I was just really exhausted by the end of the day and I was not as creative. So, I didn't have as much creative energy or maybe I could do a certain type of creative and not the other. Like I find for me, I need a lot of alone time to recharge my mind. So, I do believe it's more behaviors that changes as opposed to your actual personality type. [Angel Donovan]: That's interesting. The alone time, I've got some practical questions for you on that later. I think it'll fit in a bit later better. Thank you for that. Yeah, it's pretty interesting because, there's always the nature versus nurture argument which goes on. I tend to be more of the nurturer. A lot of the guys I've known for quite a while talk about reprogramming their minds and people like Tony Robbins... I'm sure you know him. Everyone's got their own opinion on him but, I've been to some of his seminars and he's quite up on the reprogramming your mind thing. I tend to be from that perspective. Would you go along with that or how do you feel towards that? [Michaela Chung]: It's interesting because, I do believe that... I am a fan of Tony Robbins and I do believe in reprogramming and breaking patterns but, I think you know, some things about your personality are just a bit more hardwired. They have found that introverts' brains are actually different. They have more gray matter and they tend to... their way of processing information from the external world is different. They move along different pathways. So, maybe you can reprogram yourself but, it would just be a lot more difficult than other things. It's not just like breaking a new habit. You know like, going out and getting a new personality as if it's like getting a new pair of shoes. It's like going to be probably a number of years and I personally believe when it comes to introversion/extroversion, it's better to first and foremost, play to your strengths and use what you were born with rather than focusing so much on what you think are your weaknesses and changing those. [Angel Donovan]: Excellent, excellent, cool. Yeah, let's get more into that. There are also some kind of common misunderstandings or things I think should be qualified. Is shyness or timidity, is that introversion? [Michaela Chung]: I'm glad you asked that because, that's the number one misconception and no. Shyness is different. An extrovert can shy because, shyness has to do with fear of social interaction whereas introversion is just you're drained by social interactions. So, you could be very confident and you could talk to people and come off an extrovert when you're energized but then, you just need more time alone afterwards. [Angel Donovan]: Yeah, yeah. So, those are very different even from what I was thinking before I looked this topic up. How about a quietness. You did mention something about introverts tending to think more before they speak? That's the way I understood it. So, do they tend to be more quiet or is it like you say, more like a... it sounds mostly like an energy thing. It's like if you're being social and loud, you can only do that for say an hour if you're say someone who's a very strong introvert and then, you want to go away and be alone for a little while to recharge. Is that the way or is this kind of innate quietness that is a tendency also. [Michaela Chung]: I would say after energy one of the biggest differentiating factors between an introvert and an extrovert is the way we communicate. So, introverts do take longer to think before we speak whereas as extroverts tend to be verbal processors. So, they can think and speak at the same time. So that's why yes, introverts actually do tend to be more quiet but, if they're talking about something that they know a great deal about or that they're really passionate about, then they tend to talk more. They can speak more quickly and keep up whereas, yeah if they're just in a group conversation talking about whatever and they're not really into the topic, then they might be more quiet. [Angel Donovan]: Yeah, it's interesting. I'm glad you brought up their passion or their main interest because, a lot of people who think of themselves as shy, I guess they tend to be more vocal when it's their main interest. That's actually something that we tell a lot of people to focus on when they're first like trying to get them out there and make conversation more and so on because, they do find it easier with their interests. That could be an indicator that they're an introvert then. [Michaela Chung]: Mmm-hmm, yeah absolutely. [Angel Donovan]: Okay, excellent. In today's current social culture... by the way, did you have any thoughts on the demographics or maybe you've seen some demographics on introverts in terms of age or gender or anything else? [Michaela Chung]: Not... no, nothing on age or gender. Just pretty much that it's about one third to one half of the population that are introverts. I'm sure about male/female if there's any major difference. [Angel Donovan]: Okay, I was just curious. I did get just a feeling that more millennials talk about it but, hey on the internet, there's just more millennials talking in general. [Michaela Chung]: Exactly, exactly. Oh, I hear from lots of introverts who are in their sixties and they say, "I wish I knew this sooner." [Angel Donovan]: Right, right, yeah. Definitely a selective bias probably going on there. So in today's like culture, does being an introvert put you at any social disadvantage you think? Just the way we go about things in our careers, socially, relationships, dating? [Michaela Chung]: I think it can just because of the stigma that's placed on introversion, on being an introvert but, that's changing. So yeah for us, our generation growing up, it was all about being extroverted, being gregarious, being outgoing and being quiet and wanting to be a lone was not socially acceptable. Now that there's a lot more information out there on introverts, people are discovering that, "Yeah actually, it's awesome to be an introvert because, we are capable of great amounts of focus. I mean, how many jobs out there actually require you to be able to just sit and focus and be able to work on your own and that sort of thing. I mean, that's something that would be great for a lot of introverts and also, introverts tend to have a strong intuition. They tend to be curious, observant. So, introverts have a lot of really wonderful innate strengths. It's just they've wasted so much time and energy trying to strengthen their weaknesses and become extroverts and that hasn't worked in their favor. [Angel Donovan]: Right, right. Do you think there's some aspects of social pressure towards extrovert behaviors or life styles? [Michaela Chung]: I definitely do believer there is. I hear about this a lot from the people that comment on my website, the introverts. They say people will make fun or them or say, "You're being weird. Why are you being so quiet? You're being selfish. Why do you want to be on your own?" That sort of thing. People see it as weird to want to be alone but, I do believe the ore that you embrace your introversion and accept yourself as you are, then the more you attract people who are either introverted themselves or who are just really accepting and who will recognize the good things about you. [Angel Donovan]: So, now I can see like many environments like college, potentially sports, definitely work environments. You know when I was going through the education system, I had a lot of pressure from my parents and you know from school obviously to take certain number of jobs which were esteemed to be the best jobs. I actually ended up doing that for a while, becoming a management consultant. Then five, six, seven years later, I realized I didn't like it and finally understanding and becoming more self aware and like, "I don't actually like doing this stuff everyday. I'm not happy with it and this is why I'm just not happy." So, I quit and did something else. I can see that there's a lot of social pressures for even the choices we make about careers and stuff and of course, there's very kind of extreme career choices like lab scientists or maybe a writer which would be very much suited to the kind of introversion qualities you were talking about. Then, there's sales and managing consulting where you have to spend a lot of time talking, managing people and so one which is kind of the opposite perspective. So, do you think is this something really key for people to make strategic choices about their life in order of their own happiness, like when they're choosing careers, social activities and so on? Have you got... what kind of perspective do you have on that? [Michaela Chung]: Yeah, I do think introverts can excel at any career. It's just that... here's the question I tell people to ask themselves is, "Does this serve my higher or my big picture goal in life?" If so then yeah, do what you have to do. Maybe it's worth it to push yourself a bit more to be more extroverted and that energy drain can be worth it but, sometimes it's just... a lot of times it's not worth it and it's not really what the person wants. So yeah, there are introverts who are nurses, who are teachers and it's very... it is... it's hard for them and it can be draining but, they can also be very good at it. They might find certain aspects of it such as, the time with their patients, the time with the children that they work with. They might find that replenishing enough and energizing enough that it kind of balances out. [Angel Donovan]: Excellent, you brought up energy a lot throughout this conversation and how does energy drain? How does that feel like or how could people kind of recognize it? Is it literally feeling really tired like you've been working all day or is there something a bit more specific to it? [Michaela Chung]: I think I can relate it a lot to the feeling of mental drains. So, when you've been working for a long, if you've been focused for a long time and you just feel kind of foggy and like you can't take in any more information. [Michaela Chung]: That's what's it's like because, it really is like information overload. It's just too much stimulation and you kind of start to shut down. That's a protective thing. So when introverts put up a wall if they've been socializing too long and they kind of seem to be zoning out, keeping to themselves, they might not know it but, that's actually their way of protecting their last bit of energy. [Angel Donovan]: So, is that a little bit like day dreaming? I mean, just getting kind of distracting. So, your mind would be wondering while you're hanging with a few people or you're in a meeting at work. I mean, your mind just drifts off and someone says something to ask you a question and you're like, "Oh, oh. Damn, I wasn't listening to that." Is that the kind of... do you think that's a symptom or...? [Michaela Chung]: That can be part of it. I mean, I do believe... I used to day dream all the time and I had a lot of trouble focusing on the present and I think that's something that you can train yourself to just be more in the present moment but, yes. Introverts, if they've been like out and about for a long time, they will go into their own head because, that's like their home base and that is where can recharge. So, they're blocking out the outside stimulation and going inside their head. [Angel Donovan]: So as you were saying this also, I was thinking about ADD, ADHD because, a lot of people are getting diagnosed with this these days. I don't know the stats but, there's more that... do you think some of those may not be ADD? As I understand, it's a lot taking place in the classroom in the earlier years now. They're having problems concentrating and so on. Do you think that has any relationship to it or have you spoken to people about this? [Michaela Chung]: Related to introversion? [Angel Donovan]: Yeah, yeah, just if there's any overlap? Personally, I'm not sure that ADD is the condition that it's kind of positioned to be. It might be just like you know, people are different. I think there's a bit controversy going on about it at the moment but obviously, there's a lot of medications being prescribed to people and some people feel like their kind of sub par because, they can't focus at school and stuff like that. So, I was just wondering if you had any thought s on that? [Michaela Chung]: ...a major effect. Caffeine, yeah big time. [Angel Donovan]: Okay, thanks. I was just curious about that. How would you suggest that people manage their energy levels? If they're fitting into this mold and it makes sense because, it seems like the pivotal thing right? It's learning how to manage your energy levels better so, you can kind of bring it when you want to. Then, you know how to go and recover that energy so that, you can go and use it again in a different way. [Michaela Chung]: Yeah, it's really important for introverts to understand their energy and how to manage it. So, one exercise that I offer in my book The Irresistible Introvert is just a really simply energy audit. You just write down all the things that you do during a given week and then, you write down on a scale of negative ten to positive ten whether those things energize or drain your energy. So, if it's in the negative, then it's draining. If it's in the positive, it actually gives you energy. There are lots of things that can give an introvert energy such as reading, doing yoga, meditation, time one-on-one with a close friend but, there are a lot of things that are draining. I have people go through that list, given them a number negative or positive and at the end, tally it up and see if your final score is in the negative or in the positive. If it's in the negative then, see what you can do. Brainstorm what you can do to add more positive to your live, to bring more of a balance because, you really don't have to be doing only draining activities. That's the problem is introverts think that they have all of these obligations and they don't deserve to take the time they need to recharge but, they do and they can. [Angel Donovan]: Yeah, it seems like a lot of it is accepting that you're an introvert and resisting the social pressures we were talking about earlier. Just to you know you kind of follow everyone else or what people are doing, whether it's going to lots of parties or whatever it is and just saying like, "Oh, this isn't really me. I'm something different. I like to go and party like once a week but, that's enough for me." It seems like a big degree of this is learning to accept where you are on this kind of scale. So then you can say, "No, I don't need to do those five activities which give me a negative score at the end of the week." Is that what you find people struggle with most, kind of making that trade off like saying, "Oh, I accept not to go to these things," or what do you think people struggle with in terms of the energy management? [Michaela Chung]: Yeah, that is really the biggest thing is accepting it and not feeling guilty about it. I think most introverts feel really horrible about it. They feel like there's something wrong with them. So, they need to hear over and over again, "You know, it's okay. A lot of people like you. You don't have to feel guilty." Yeah, that's part of the self-acceptance bit. [Angel Donovan]: Yeah, yeah. So, say you've been out socializing all day or maybe you're talking at some seminar and say you were doing speaking and you felt this drain, this energy drain, what would you do afterwards typically to recover? What types of things do you typically do or do you find are the most common that people are doing? [Michaela Chung]: For me, I've even... I've taken to going for short walks. Like even if I'm at a really long event, then I'll just step outside for a bit. Of course, not in the middle of a talk or anything like that or at a time when it would seem rude but often, there are a lot of times when you can just take a step out when there's nothing really happening and it's worth it and you just have to have that mind-set shift of, "I'm going to be better off this way. I'm going to be more present when I do return." [Angel Donovan]: Yeah, so just because, I could imagine people would feel socially awkward about that. Say they're at some event and so, what do you say, "Hey, I?m just going to..." Like do you ask someone else to go for a walk with you or do you just walk out on your own without saying anything to anyone or do you like, "Hey, I'm just going to go for a walk. I'll be back in 15 minutes. I just want some free air." Like how do you deal with that socially? [Michaela Chung]: Yeah, of course it depends on the event. If it's a large-scale event then, you don't have to worry so much. You can just kind of slip. If it's a smaller thing, then yeah. I think communication is a big deal and this is what's tough for introverts because, we do tend to have communication problems. [Michaela Chung]: So, just explain that it's not able them. "I just need time to myself for a moment." [Angel Donovan]: Right yeah, that's a good point because, people often assume that something's up if someone just goes off for a while, right? I guess, that's considered an unusual behavior at like one of those that you were talking about earlier. So, you think that like potentially half of society would benefit from taking steps out? [Angel Donovan]: Okay, so let's just talk about the kind of the implications for dating and relationships. If you're an introverted guy, what would you say are the biggest implications for these areas that they should think towards? [Angel Donovan]: Oh, so it kind of take an extroverted woman to get to him because, an introvert wouldn't be as forward. Is that the way you look at it? [Michaela Chung]: Yeah, I mean usually, introverts will you know be the the observers and they will wait longer and yes, they're not as likely to approach. So, they get into this dynamic where it's a more extroverted woman and often time, this woman will kind of over step his boundaries a bit and she'll be offended when he needs time alone and kind of crowd his personal space. The key to avoiding that is either to learn how to approach so you can choose women... specially target women who are maybe have a softer personality, who are introverted as well or to be up front at the beginning. Like, "You know, I'm an introvert. I do need space. So, just don't take it personally if I need to be alone for a day or two. That's just me. It's just the way I am." I find people, if you do that early on, they understand and there's far fewer hurt feelings. [Angel Donovan]: Yeah, you make some great points. I've seen over the years, for other reasons, I'll be antisocial because, I'm busy with business or something. I have a fair number of friends who are kind of like that. It's considered antisocial with a new girl and so on. Having a talk about it, brining it up, up front saying that, "You know, I'm only going to be like really available twice or three times a week just because, I'm really focused on what I'm doing," right? So, you could easily change that up and you could make it about your introversion or you could just make it like... I do the same thing. One of my other friends, he had what he called a study day, right? So, you could say that's more of an alone day and every Sunday he would just be reading and studying and stuff. So, he wouldn't see his girlfriend and she knew that's what he was doing and it wasn't like he was off cheating or anything. She felt cool about it but, if you don't say anything and it's a behavior... I think we were talking about boundaries. You're kind of saying that they have to kind of carve out things in their schedule for this alone time and make it clear. How does it work out typically in a relationship? [Angel Donovan]: Yeah and what just specifically on these kind of notes. I mean, do people... do you find that people say, "Hey, I'm an introvert," and then they explain it or how does it typically go down? [Michaela Chung]: So of course, you don't have to say specifically, "I'm an introvert," but say, "This is something about me that I really like my alone." For me, it's kind of obvious because, this is what I do but, yeah to express it. Then also to be consistent early one because, you would think for introverts that we would keep our space and put up a wall when it comes to relationships but often times, introverts will have one person such as their partner, girlfriend or boyfriend who they let in. Who they just completely let in and they have no boundaries with and that's like their person for all of their needs, all of their social interactions. Then, they'll get overwhelmed and then, kind of say, "I need space," and that will confuse the person. [Michaela Chung]: So actually, be consistent from the beginning and force yourself to take time alone and to maintain your space and not depend on that person for all of your social needs. Even though it feels really good and it's nice to be comfortable with someone, to still kind of force yourself do other things that you like and spend time with your other friends. [Angel Donovan]: Yeah, I mean that's always good advice all around. It sounds like the first step is to become aware of what your needs are with your audit, for example from your book. You have... obviously, you have to do that before you're dating someone to understand what those boundaries and what you actually need. So, when we're talking about boundaries, we're just saying, "Ok, I know that I need this amount of alone time. So, I'm not going to forsake that because, I've just met this person and I'm just going to spend all my time with them for the first four weeks of the relationship," because that tends to be the passionate fun bit and people do like get it... let it get away. So, you're saying like you know... and afterwards a person's going to be really surprised when you kind of revert back to your needs again and you're like, "Oh, I'd forgotten about all my needs, my alone time. I'm feeling a bit drained." [Michaela Chung]: Yeah exactly, that's a great way of summarizing it. For me, a lot of times I phrase it as "permissions." So at the beginning, part of being aware is actually outlining your permission. So, I give myself permission to spend time alone. I give myself permission to tell people what I need, that sort of thing. So, you outline that ahead of time and then, you don't feel guilty and you don't chicken out. [Angel Donovan]: Yeah, yeah, excellent. What do you think of dating apps? Right because like I'm sure a lot of people are thinking and I'm thinking like dating apps are probably something that works a little bit better than some dating coaches or pick up artists. I'm sure you know what pick up artists are. [Angel Donovan]: They tell... basically, tell everyone that you've got to run into clubs and you're going to meet girls like that. Obviously given the context of our conversation today, that doesn't sound like how an introvert is going to enjoy the experience and they're going to find it harder in terms of energy and stuff and it might just be an uphill struggle. So, I don't know what you think about that, the whole clubbing thing and partying aspects and how introverts relate to that and also dating apps. Like is that something that fits well with the introvert better than perhaps the extrovert? [Michaela Chung]: Well yeah, a lot of introverts will want to default to online dating services and apps just because it's a bit more comfortable. It can be less straining at first. I don't think it's necessarily better than meeting someone in person but, I think it can be just as good. I've met people both ways and I've had success both ways. For example, I met my current boyfriend through Plenty of Fish. [Michaela Chung]: I think there's just a whole different set of rules for that beginning part when you're having the online interaction. I will say for introverts, the big thing... and for anyone really, is to not get into that cycle of just talking on line and then, taking forever to meet in person. I think if you can meet in person, then you should meet in person pretty quickly because, you really can't get to know a person that well just by messaging. Even through Skype, there are things that you just don't recognize. So definitely, meet people as soon as you can. [Angel Donovan]: Absolutely, that's just good online dating advice all around because, sometimes you've been talking to someone for a couple of weeks. Then, you meet them and they're absolutely not the person you thought they were. That can work both ways. Just sometimes a text doesn't transfer to the face-to-face. [Angel Donovan]: Yeah, like Skype video calls can be helpful. Like, I found that people are more open to that these days and Facetime and what have you. So, that can give you a better feel for the person if you can set that up quicker if you're far away from each other but, there's not really a substitute for face-to-face. How long did it take you to meet your boyfriend, just out of curiosity? [Michaela Chung]: How long were we kind messaging? [Michaela Chung]: We actually have a funny story but, it was only a few days and I didn't have a picture up and he actually agreed to meet me without seeing my picture. I'm that persuasive with my words. [Angel Donovan]: Wow, what did you say to him? Yeah, exactly. [Michaela Chung]: Well, I think it was my tone in the way I was writing. He said he could just tell I was not... I was educated and I was like a normal person and wasn't crazy. [Angel Donovan]: Not a psycho. [Michaela Chung]: Yeah, not psycho. [Michaela Chung]: And I just said, "You know, I think it would be..." He asked to meet me. First he said, "You know, would you be open to meeting for coffee and would you be open to sharing pictures with me." I said, "Well, I'm impressed that you asked to see my pictures after you invited me to coffee," and I said, "Well just for fun, what do you think of meeting without seeing my pictures. I swear to you that I'm not a dude." [Michaela Chung]: "And I'm not a freak like who weighs 1000 pounds or whatever. I just think it would be fun," and he said, "Sure." [Angel Donovan]: Awesome, that's a nice story. [Angel Donovan]: Yeah, there's a lot of cool stories about dating app since this whole thing has come up. I think there must be like 20-30% of people are meeting, having serious relationships like this now. [Angel Donovan]: ... like I said, there's a lot of pressure for people and especially guys who have been taking dating advice. I think there's probably 80% of the dating advice out there is talking about clubs and bars and actually, the whole population. You know, they're all going to clubs and bars and that's where they feel like they meet people over the weekends and then, the rest of the week they're working or whatever. How does this cross over into introverts? I don't know if you've learned anything from your community and what seems to work and what doesn't or if there's rules to clubs and bars. [Michaela Chung]: Yeah, I would say clubs and bars are probably the worst places for introverts to meet people and that goes back to what I talked about earlier about communication and over stimulation. I mean, talk about over stimulating. Clubs and bars are super loud. They have bright lights. There are groups of people crowded together and so, it's just not the best place for an introvert to shine. I like to think of it as... as far as the best places for introverted men to meet women, I just think of a beautiful picture and having the right frame. So in my book, I talk about the Mona Lisa and how there are really three things that make this painting so famous and so intriguing. One is, it's actually surprising how small it is. It's not the size that makes it famous and intriguing. It's actually the use of contrast for intrigue. Okay? It uses light and dark and draws you in. Not through bright colors and its huge size. Okay? It's having that subtly and that contrast. So, for introverts having contrast in their personality. Being kind of mysterious but actually, really deep and being kind and friendly but, also needing their space. You know, that can be very intriguing. Then, having the right frame. So, putting themselves in the right frame would not be a club because, that would be too overwhelming. It would be somewhere where they feel at home. So, that could be something to do with their passions. It could be the outdoors. It could be some kind of art scene. You know, it could be a number of things but, it really has to do with thinking of what kind of frame is not going to overwhelm you but instead, compliment you. [Angel Donovan]: Right. So I guess if they're thinking about where they're at their best. Where they feel they're at their best, like you said, their interests, things like that because, I know a lot of guys don't feel comfortable in clubs and in bars. Maybe a large percentage of those guys are introverted. As you say, it's the over stimulation just from the environment and the way it's set up and everything. Have you spoken to a lot of people and they tend to figure this out this way by thinking about... so, "I'm happiest when I'm hanging out with a small group of friends in a quiet bar," or these kind of things like that where they just think about... I guess the other thing I'm thinking about is like one of the other problems is like people have comfort zones. [Angel Donovan]: And when they're trying to improve their lives, change their lives or if something hasn't been working, like they haven't been meeting any girls, they've obviously got to change something and obviously, a part of that is breaking out of the comfort zone. We all have comfort zones in everything we do. Part of growth is breaking out of that. So, I guess like there's this bit of conundrum where you have to figure out, "I'm resisting this because, it's my comfort zone..."
[Angel Donovan]: "...but, I'm resisting this because, I am an introvert because, I follow this conversation and this seems like me and this seems like it's right for me. So, this is actually part of me and in the long term, my life is going to be better and it's going to be playing towards my strengths rather than it being a comfort zone thing which I should actually break out of because, that's just kind of a habit I have or it's something I got used to." [Michaela Chung]: Yeah, I think a big thing for introverts is... when I take introverts through my... a couple of online course on connection and confidence.... so, when I take them through them, a big theme is taking small steps. Focusing on one thing at a time and kind of the advice that a lot introverts have received is to just do it and just kind of throw themselves into this really scary situation or a really overwhelming situation. But, I like to think of things as more an experiment and you only need to try one thing at a time and see how it feels. Another interesting thing about a lot of introverts is when it comes to social activities, even though we might really, really want to make a new friend or meet a boyfriend or girlfriend, we kind of need an ulterior motive. We kind of need an extra carrot to actually get out there and do it and that's why doing something that is related to your passion and having a hobby is going push you further. It's going to make you more consistent in actually getting out there. Like for me for example, I met so many of my boyfriend through salsa dancing because, I was super passionate about salsa dancing. I competed, I performed and I was always out there social dancing. I just naturally met a lot of guys that way and that was my circle of people. Although, it wouldn't have been enough for me to just go because, I wanted to meet men. So, I think you just kind of need to have another carrot dangling to be motivating to push you out of your comfort zone sometimes. [Angel Donovan]: ... can never hurt, more leverage. So, one thing we missed I wanted to touch on is intimacy because, I was wondering if this is something you've come across on a topic that your community talks about a fair bit. Is it more difficult for introverts to get intimate with people and to kind of open up and breach that or what's there to be said about intimacy? [Michaela Chung]: ... sharing, sharing, sharing. I would say the biggest things for developing intimacy would be to just decide to give themselves permission to share without invitation because, it's hard for other people to know the right questions to ask and again, it can just be one small thing, one step at a time. So just, start by sharing one thing that you're passionate about, one thing that scares you, one thing about your childhood. You know, it doesn't have to be something really deep and emotional right away. [Michaela Chung]: But just, yeah start off by giving yourself permission to share without invitation. [Angel Donovan]: That's a great, great point. So, could you give an example of that? I don't know if you can think of a concrete example. I always find these help people a lot. [Michaela Chung]: Yeah definitely. So, say you're kind of in the early stage of a relationship and the person you're with has shared a lot and they share their opinions and maybe you haven't... you've agreed with what they've said but, you haven't really shared your thoughts. So maybe... I'm going to give you a kind of a superficial example but, maybe they're super passionate about the outdoors and they love camping and you actually have had bad experiences with camping but, you don't really share that. You're kind of like, "Oh, that's cool," but instead just say, "No, I'm going to give myself permission to share this little tid bit about myself." You might say, "You know, that's cool that you like camping but, I actually hate camping and this is the reason why. Like I had this really crazy experience when I was younger." Part of that yeah is sharing your opinions but also just kind of thinking, "You know, she didn't ask me but, I'm going to share a story about myself anyways." [Angel Donovan]: Yeah, connected with the topic. Stories are always... like childhood stories are always a great, great thing for intimacy I find. There's obviously a lot of connections with the memorable things like, "I don't like camping," and the things that have kind of stuck with you over time. It's a great opportunity to talk a little bit more about yourself and share something important. Okay, awesome. Let's round off. Thank you so much for your time today. What are the best ways for people to connect with you and learn more about you and what you do? [Michaela Chung]: Well first of all, come on down to my website http://www.IntrovertSpring.com. I have a wealth of free resources and over 300 articles on introversion and related topics and also be sure to subscribe and get lots of free goodies that way... Check out my book, The Irresistable Introvert: Harness the Power of Quiet Carisma in a Loud World. [Angel Donovan]: Awesome, thank you. Is there anyone besides yourself you'd recommend for good advice or knowledge in the area socializing, dating, relationships? [Michaela Chung]: Definitely for introverted men, Sarah Jones of http://www.IntrovertAlpha.com is the go-to coach for introverted men for dating. She's a great resource and also Dan Chang founder http://www.TheFriendFormula.com. He gives great advice on breaking through that awkward small talk and actually having interesting conversations. [Angel Donovan]: Thank you very much for those. What would be your top three recommendations to guys, like introverted guys who are starting from scratch? They want to improve their dating like and they've listened to this and they're like, "Oh, I'm introverted." What would be the top three things to get started with? [Michaela Chung]: Well first, understand yourself better, understand introversion. Then, you're on your way to accepting yourself. Then, I know everyone wants to skip over this part but, of course work on the mindset stuff. Work on core confidence because, if you go out there and try and meet women and be charismatic without doing the inner work then, it's just like going out like a balloon and you're just full of hot air and it's going to deflate at some point. So, work on the inner stuff and then, take one small step at a time. See it as an experiment. Focus on the action of actually doing that one thing, you know getting out there, saying hello to women as opposed to pushing yourself and doing everything at once and focusing solely on outcomes. [Angel Donovan]: Great Michaela, thank you for those takeaways and thank you for spending the time with us today. It's been great having you on the show. [Michaela Chung]: It's been great being here. Thanks for having me.